Montreal Angels Lindsay Belzie and Kate Allbon-Sargeant teamed up with the New York Magpies at this year's US Nationals tournament in Mason, Ohio. The Magpie/Angles drew some tough opponents first up in the Calgary Kookaburras and were well beaten failing to score a goal. With Kate and Lindsay playing out of Full-forward and Centre Half-forward respectively, the team put in a much better effort in game two. Lindsay Belzie took a great pack mark at the top of the goal square and converted for the Magpie/Angels first goal, but the Minnesota Freeze were too good taking home the win. Finishing at the bottom of their pool, the team had one last shot at redemption on day two against Sacramento. This time the hard work would pay off as the Magpie/Angels took home the victory finishing the tournament in 5th place. The Denver Lady Bulldogs defeated the Boston Lady Demons in the final to take out the championship. AFL Quebec will be hosting an Australian Football League Grand Final Party this Friday, September 28th at the Forum Sports Bar in Montreal. This event promises to be one like no other! Although every AFL Grand Final is special, this one will be even more remarkable as Mike Pyke, of the Sydney Swans, will be the first Canadian to play in an AFL Grand Final. Hailing from British Columbia, he represented Canada at the Rugby World Cup in 2007 and made his debut in the AFL in 2009.
of the Montreal Angels and the Quebec Saints. Australian Football is growing in popularity in many countries. Every 3 years, countries compete in the International Championships which are held in Australia. 2011 marked the introduction of the first ever women's competition seeing 5 countries represented, Canada finishing 2nd overall. At that event, Mike Pyke took the time to give the players of the Northern Lights (Team Canada - Women) a pre-match pep talk for their match up against Papua New Guinea in front of the Sydney Swans headquarters. The Montreal Angels wish both teams (the Hawthorn Hawks and the Sydney Swans) good luck in the AFL Grand Final but admit they have a soft spot for the Sydney Swans thanks to Mike Pyke. 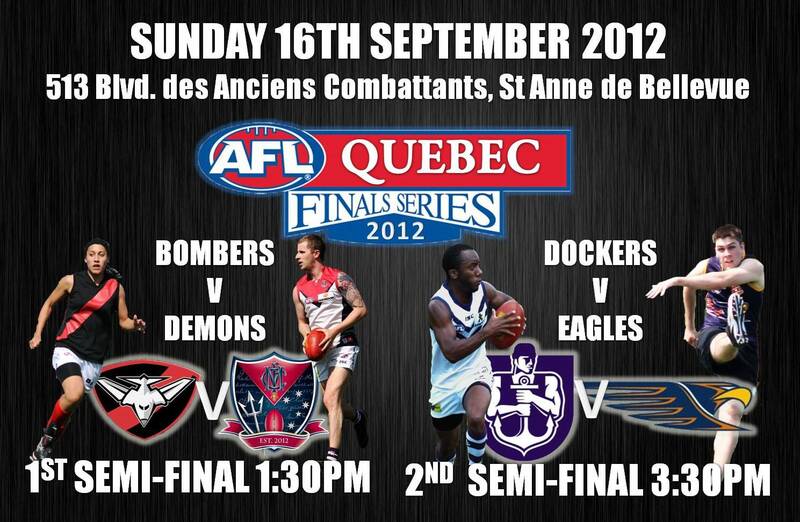 The Montreal Angels will be in action this Sunday as they compete in the AFL Quebec Semi-Finals in Ste-Anne-de-Bellevue. Get down to the field to cheer them on, action kicks off from 1:30pm! Stateside Footy's complete coverage of the 2012 Boston Tri-team tournament held in June. The Montreal Angels claimed two victories to claim the tournament win, but not before reeling in a massive deficit against a determined Boston outfit in a game that was decided in the final 60 seconds. 2012 49th Parallel Cup - Image courtesy of Autumn Ervin. The battle for honours at the 49th Parallel Cup have been taken by the United States who claimed three victories from the four matches this past weekend. Flying the Canadian flag, the Northern Lights Development squad captained by Angel Lindsay Belzie was the only team to break through for a win. National team debutants Kelsey Martin and Tara Cools-Lartigue were also part of the successful squad. Kelsey Martin made it a debut to remember with two goals. For a podcast of the matches click here. 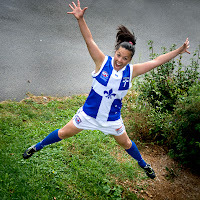 It marks a huge leap for footy in Quebec as five Montreal Angels and Eight Quebec Saints players suit up for Canada in the 49th Parallel Cup this Saturday 4th August. You can follow all the action of the Canada Northern Lights (Women's team) and Canada Northwind (Men) live thanks to Ohio Sports Radio. The radio station's link can be found by clicking here. Two Angels will be making the national debut, check out their player profiles by clicking here. Tune in and cheer on Quebec's elite Aussie Rules footballers as the women defend the cup and the men strive to win back theirs from the USA Revolution!! 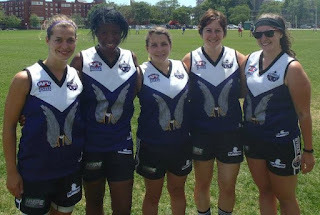 Six Montreal Angels have been named to Team Canada’s Aussie Rules Football squad (called the Northern Lights) to compete against the United States for the 49th Parallel Cup in Dublin, Ohio on August 4th, 2012. The Cup takes its name from the circle latitude that delineates the international borders between Canada and the USA and has fast become the annual North American grudge match. Although the first game played for the cup was in 1999, it would take 11 years before the 49th Parallel Cup introduced a women’s competition in 2010. The inaugural women’s 49th Parallel Cup in Toronto saw two Montreal Angels represent Quebec in national colours. Building on that success the following year, three Angels travelled to Australia to participate in the first ever women’s International Cup. Angel Aimee Legault was bestowed with the honour of captaining Team Canada and was eventually named to the World team for her standout efforts during the tournament. The Angels are proud to announce that Lindsay Belzie, Mirabel Eboka, Tara Cools-Lartigue, Aimee Legault, Kelsey Martin and Margo Legault have all been chosen to represent Canada in Dublin, Ohio. These players will be accompanied by Angels head coach Ronan Shaughnessy who has been selected as one of Team Canada’s assistant coaches. Never travelling without an entourage, the girls will be well supported as many players from the Quebec Saints have also been named to the Team Canada’s Under 23 squad and will be on hand cheering the girls on to victory. 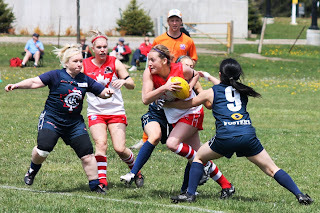 Despite being a relatively unfamiliar sport to most Canadians, Aussie Rules is an exciting, up-and-coming fast paced game that offers everything to the prospective player, even the chance to wear their countries guernsey on the national stage. The Montreal Angels have been able to build on these experiences and harness the interest that is created abroad to develop locally. The combination of playing in a weekly co-ed league in Montreal and also travelling to Boston, Philadelphia, Ottawa and Toronto to compete, means that the Angels have gained valuable game experience throughout the season. Having forged bonds with teams in the East and in Ontario, the Angels will already know many of their Team Canada teammates, but will also face the prospect of competing against players from New York and Boston with which the team has formed a close bond with this year. The Montreal Angels would like to wish all of the players good luck for the 49th Parallel Cup. It's been a long dry spell for footy in Ottawa, six years in fact since Aussie Rules kicked off in the nation's capital, each of those seasons without any post-season activity. But it seems it's finally time to let the f word out of the bag: finals. The Angel/Swans combine team registered another victory this past weekend as the squad easily accounted for the Toronto Central Lady Blues in the nation's capital. A big four goals to nil first half from the Montreal/Ottawa squad set up the victory, the team heading in to halftime with a commanding 26 point lead. The Lady Blues would rally in the second half restricting the home team to just one goal, but the deficit would prove too large, the Angel/Swans running away comfortable victors and keeping the Lady Blues goalless, 5.8 (38) to 0.4 (4). Angel Lindsay Belzie was superb up front with three goals for the victors. The victory now sees the Angel/Swans outright second on the league table with a 5-1 record. The Angel/Swans have a tough final three matches to the season starting with the third placed Etobicoke Lady Roos next weekend in Ottawa. At 4-1 the Lady Roos have only tasted defeat once this year themselves losing to the undefeated High Park Demons by 39 points in Round 1. The Montreal Angels have come away with a perfect record in Boston claiming two victories in the tri-series tournament against the New York Lady Magpies and the Boston Lady Demons. The Lady Demons proved hard to beat at home with both the Angels and Lady Demons having 9 scoring shots. It would be the Angels slightly better accuracy that would see them edge out the ever improving New England squad by just 5 points. Angels 4.5 (29) def. Lady Demons 3.6 (24). In game two against the Magpies the Angels won first half arm-wrestle to get to half time just six points in front of a gallant New York team. It would take a invigorated second half effort for the Montreal team to eventually put the game away running away 29 point victors with a 4.5 (29) to 0.0 (0) scoreline. The Boston girls would eventually get a much deserved 'W' in game three taking the points over New York by 18 points, Boston 3.2 (20) to New York 0.2 (2). It would be a tough day at the office for the men's squad who were facing off against a Boston River Rats Metro team. After getting jumped early the Saints were never able to recover, but steadied late in the game to add some respectability to the scoreboard. The Boston River Rats 15.7 (97) defeating the Quebec Saints 4.6 (30) to the tune of 67 points. 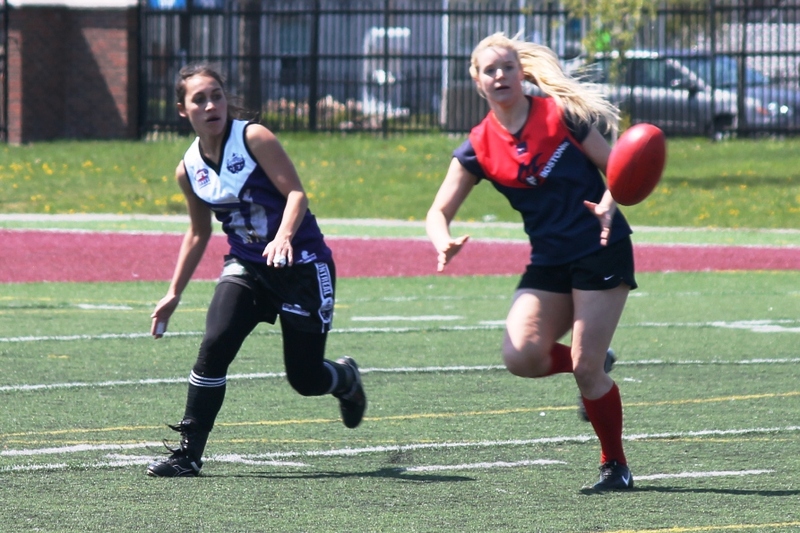 The Montreal Angels partnership with the newly formed Ottawa Swan's women's club continued its excellent form this past weekend moving to 3-1 for the season and nestling in to second place on the OAFL league table. The full match report is here. The team squared off against Hamilton in Toronto, the Lady Wildcats making a big splash in their first year with two wins from their first three games themselves. With Tara Cools-Lartigue, Aimee Legault, Margo Legault, Mirabel Eboka and Kelsey making the trip down the 401, the Angel-Swans were in no mood for mercy, stunning the Wildcats with an all-out assault in the first term kicking four goals from nine scoring shots while the Hamilton squad were unable to trouble the scoreboard. The tone would remain much the same for the remainder of the match, the Angel-Swans collecting a valuable win on the road to the tune of 84 points. Angel Aimee Legault was outstanding with six goals whilst Margo Legault was also named amongst the team's best. Angel-Swans Aimee Legault and Emma Dickinson have formed one of the most potent attacking duos in the league, both players currently head the league goal kicking table with 9 goals apiece. The Wildcats will get a shot at redemption on Saturday, June 30th as they make the journey to Ottawa. 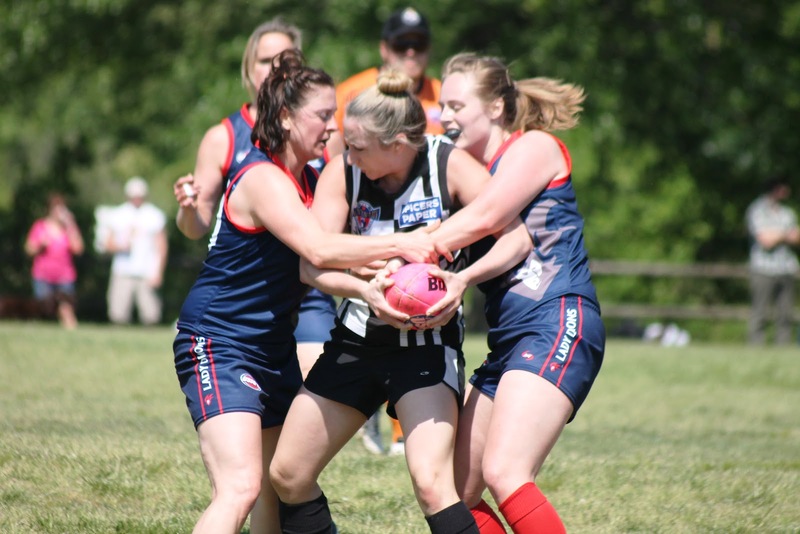 Women's footy in North America took another giant step this weekend at the Philadelphia Aussie Rules Tournament. Players from Montreal, Boston, New York, Baltimore and Ontario teamed up to field two 14-a-side teams on a full sized field, a break from the usual 9-a-side squads that dominate the women's version of the game. The result was an outstanding game of footy that eventually fell the way of the Boston/Montreal combine team, taking home the win by 32 points Boston/Montreal 8.10 (58) defeating New York/Balt/Ont 4.2 (26). It was also another good weekend for the five Angels who made the trek south. Aimee Legault again outstanding through the midfield while Lindsay Belzie was proving a massive headache up forward for the New York defenders. Unheralded Canadian national player Margo Legault was in stellar form, making every touch of the football an effective one with countless goal assists whilst once again proving a titan on defence. Down back Kate Allbon-Sargeant proved a thorn in the side of the Magpie attackers burrowing her way in to the bottom of the packs and coming up with the footy time and time again. It was also a break-out game for Emily Legault who was given the job of shutting down some of the Magpies big guns up front, a task she proved she was more the capable of handling. The Angels upcoming matches are May 26th (playing as Ottawa Swans in Toronto) and May 27th AFL Quebec Round 3 (Co-ed) in Montreal. Stay tuned for the match report. The Montreal Angels Aussie Rules Football Team is ecstatic about their new found partnership with Hype Energy Drinks. With the 2012 season just kicking off, Hype and the Angels have many trips ahead of them, including games scheduled in Ottawa, Toronto, Calgary, Boston, New York and Philadelphia. Who are the Angels you say? We're a bunch of fearless, strong, good-looking and fun women athletes who play a crazy sport from down under. We feel like Hype is a good match for us because it's original, wacky and stands out, just like us! What is Aussie Rules? It's like nothing you've ever seen! A fusion of all your favourite sports, the idea is to try and kick the ball through vertical posts, all the while dodging body checks and tackles from the opposition. The ball is oval and you can run with it. You can either kick it or punch it to a team mate, but if you decide to keep it you have to bounce it on the grass after running 10 yards. 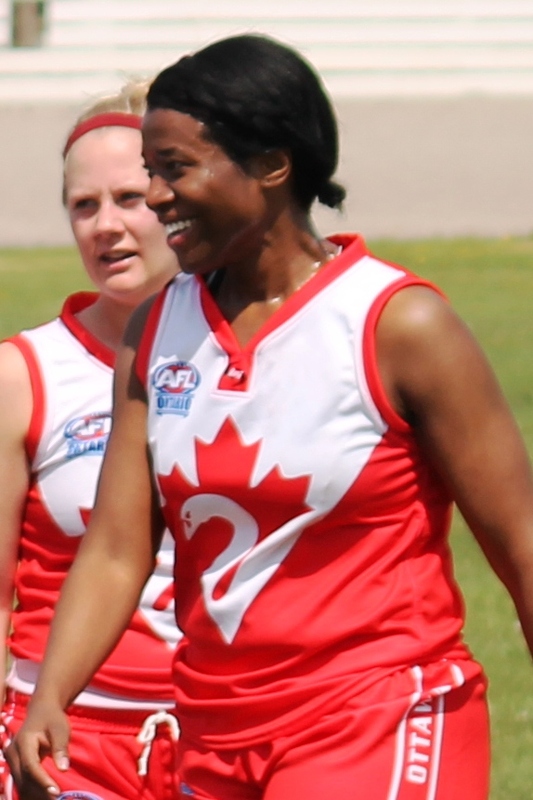 After claiming the title of Canadian Women's National Championship in 2010, the Angels had three players represent Canada in the first ever women's International Championships in Australia in June 2011.
their first win at the AFL Quebec pre-season tournament hosted in Montreal. The Montreal Angels will travel to Ottawa Saturday to join forces with the Swanettes and take on the High Park Demons of the OAFL. The Swanettes made the long journey down the 401 last Saturday and pulled off an impressive victory against the Toronto Central Blues. The match is scheduled to kick-off at 1pm at Rideau Carelton Raceway in Ottawa. 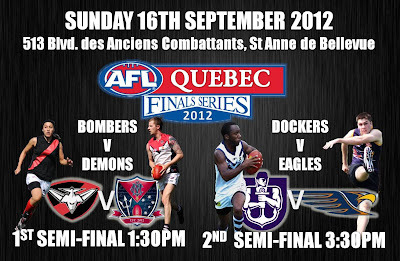 Angels are also advised that this coming Sunday is Round 2 of the AFL Quebec season and to check the official website for further details. A few things I’d never encountered in over 40 years of footy-going: snow en route to a game; a bagpipe medley of Advance Australia Fair and Waltzing Matilda; a rule forbidding goals kicked from beyond the 30-yard line; a field of artificial turf; barracking in French. But that was before last weekend, and the playoffs for the AFL Quebec preseason cup: six men’s teams (all local), three women’s teams. We were there (via the Ben&Jerry’s factory in Vermont and a drive through four hours of snow flurries) to cheer on the Boston Lady Demons, because our Lydia was pulling on the boots as their full forward. She’d played two games of competitive footy in her life before we moved to the States; she’s already got three more under her belt, courtesy of the USAFL National Championships last October. The new Boston team had taken eight players to Nationals for a combine team (the Boston Lady Demons/Columbus Jillaroos/Baltimore Washington Eagles – a bit of a mouthful for us barrackers), and had been working their butts off since to recruit and train players for the forthcoming season. In fact, recruiting’s gone so well that the Preseason Cup Footy Record (an impressive 28 pages with colour cover) still lists the Montreal Angels’ opponent as a Boston/New York combine, but Boston’s fielding a full nine-a-side team, and New York’s brought eight girls. A handful of ring-ins from Ontario turn it into a three-way comp, and give the teams some subs. At nineteen, Lydia’s the baby of the Boston team, and their only Australian. If you long for the days of old-fashioned hard-fought footy, played by people with an unrivalled love of the game, you can’t go past women’s footy in North America. These aren’t players who’ve grown up obsessed with footy, being dressed in club colours from the cot onwards, trotting off to Auskick. These are players who’ve stumbled on the game – or on someone who plays the game – and become hooked. And some bring star quality and a history of sporting excellence to their new love. International Cup veterans like Montreal’s Aimee Legualt, New York’s Drea Casillas, and Boston’s own Emily Riehl could match it with the men of many local footy teams at home in Australia. 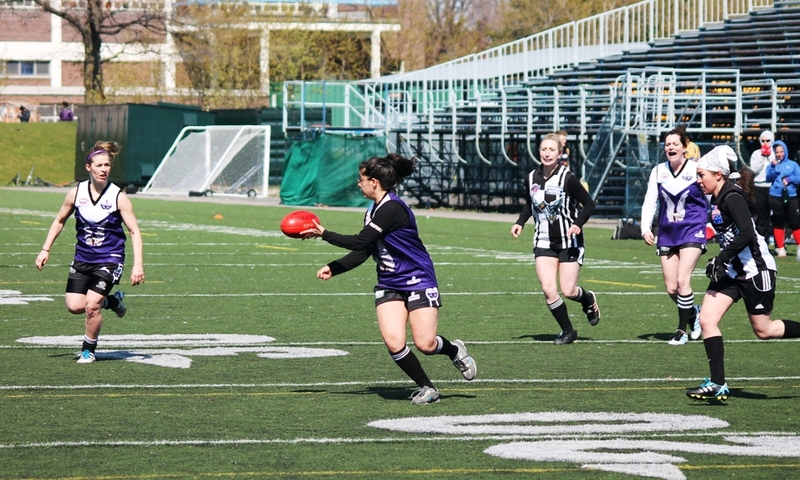 The Montreal Angels fought out a hard day at the office to eventually overcome the Boston Lady Demons and New York Magpies to claim the 2012 AFL Quebec Preseason Cup. The Demons started well with a solid win over the Magpies but dropped their next match against the Angels. 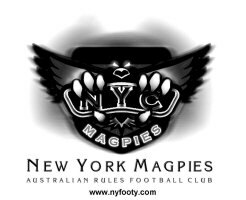 It meant a win for the Angels in game 2 against the New York Magpies would secure the cup. The Angels got the job done in what was a major boost for women's footy in Montreal and a superb display of skilled football from all three teams. With less than 24 hours until the official kick-off of the 2012 AFL Quebec Preseason tournament, the official news out of Montreal is that the women's cup will be contested between three teams in a massive boost for women's footy in the region. The Montreal Angels have aligned with partner club Ottawa Swans' newly developed women's team and will go head-to-head-to-head with both the New York Magpies and Boston Lady Demons for the second ever women's Preseason Crown. The event will also be the unveiling of the Angels new playing strip and head coach for the upcoming season. Players are encouraged to be at the field by 9am as the action kicks off at 10. Location: 7141 rue Sherbrooke Ouest, Concordia University - Loyola Campus, Montreal. 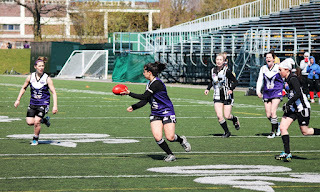 The Montreal Angels will host a New York Magpies/ Boston Lady Demons combine team for the 2012 AFL Quebec Preseason Cup on the 28th of April in Montreal. It will be the first time the Angels have squared off against a United States women's team. The Angels will be well supported by players from the newly formed Ottawa Swans women's team. The Angels are always looking for new recruits, no experience is necessary. The girls look forward to all the support they can get retaining the Preseason Cup and encourage all fans and spectators to get along to the Loyola Campus at Concordia University to cheer on the team. 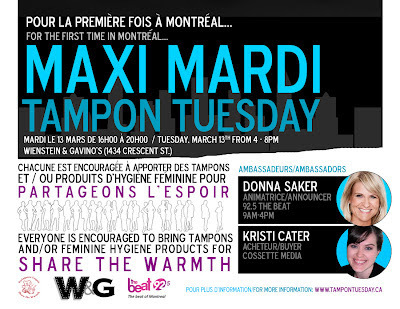 For further information contact Margo Legault at margo@aflquebec.ca and like us on Facebook. Chairman of the Melbourne Football Club and co-founder of the Reach Foundation, Irish-born Jim Stynes will be terribly missed by all. 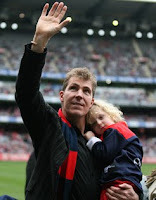 Among his accolades he holds the VFL/AFL record for most consecutive games played in a row (244) and is the first and only player recruited outside of Australia to receive the Brownlow Medal. 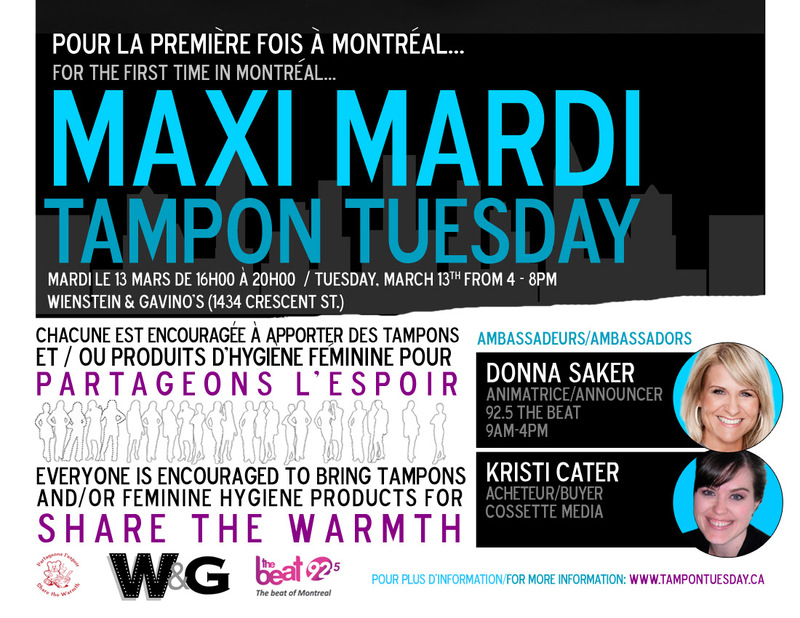 The Montreal Angels will be collecting boxes of tampons and feminine hygiene products in support of Share the Warmth because no woman should have to choose between buying a bag of milk or purchasing this necessary monthly product. Web exclusive with Gaby F.
Here is a short interview with Gaby F. after her first indoor footy training. 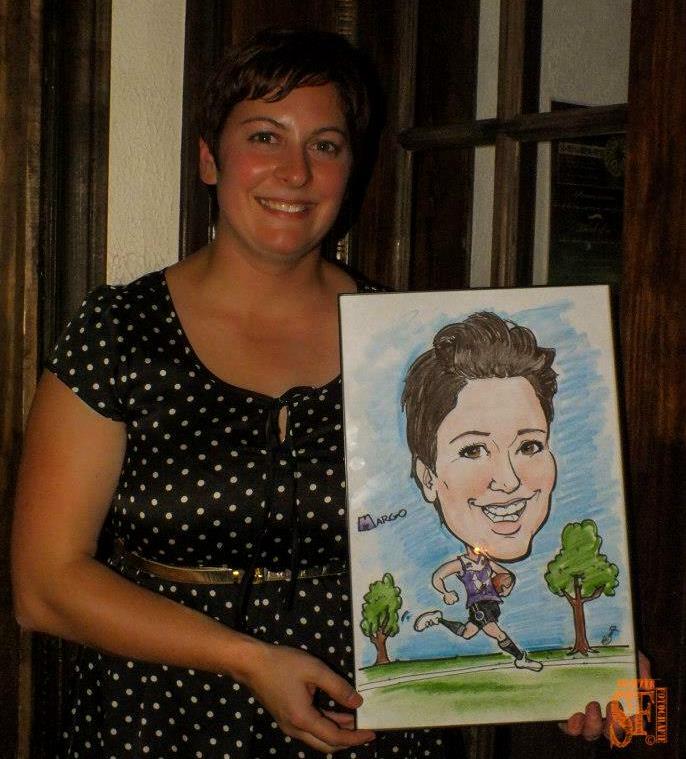 Gaby is a recent Marketing Graduate from the John Molson School of Business. Have you ever seen it on tv? A few years ago..I was intrigued but had no clue what I was watching. What were your first impressions of the training session? Awesome, fast paced and intense sport. Did you find it weird practicing with the men? Not at all, everyone is really friendly and the vets definitely have a passion for the game. What would you say to someone who has never played before? That its a sick sport and they should definitely give it a try. Especially if they've played anything like, handball, soccer, rugby, football before. It looks like the sport is about to kick off in the next few years for both girls and guys and it be fun for anyone to be a core part of that. Labels: Web exclusive with Gaby F.
Come join the Angels for some fun and fitness, starting February 2oth.